Award-winning documentary "Your Health: A Sacred Matter" and accompanying study guide serves as a comprehensive overview of the relationship between religion, spirituality and health. The film is airing on PBS stations nationwide. Religious beliefs and practices promote greater well being, greater happiness, better mental health, healthier lifestyles, greater social support and ultimately better physical health and faster recovery. There is another crisis in our healthcare system and it is not declining reimbursement rates or bureaucratic interference. Our healthcare system may be suffering from a crisis of faith. 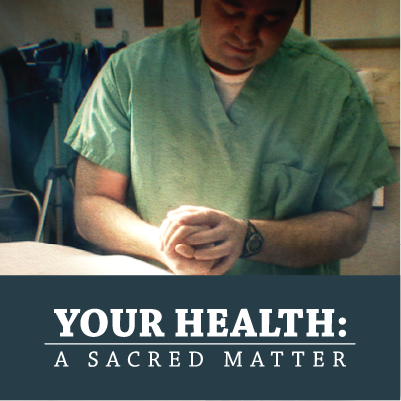 The public television documentary “Your Health: A Sacred Matter” (https://yourhealthasacredmatter.com/) investigates this crisis from the perspective of patients and medical professionals. Dr. Harold Koenig is at the forefront of the effort to bring spirituality back to medical care as the Director of the Center for Spirituality, Theology and Health at Duke University and the author of several books on the subject. “Religious involvement, religious beliefs and practices are good for your health. They promote greater well being, greater happiness, better mental health, healthier lifestyles, greater social support and ultimately better physical health and faster recovery,” says Keonig in the documentary. Spirituality is important not just for patients, but for medical professionals as well. Since doctors themselves come from all different religious backgrounds, it is important for them to learn how to speak with patients about their spiritual practices. Dr. Daniel Sulmasy, Senior Research Scholar at the Kennedy Institute of Ethics, is another leader in the field of spirituality and healthcare. As Emeritus Associate Director of Clinical Medical Ethics at the University of Chicago, he helped train doctors to make sure they were able to meet the spiritual needs of their patients as well as their medical needs. The challenge is teaching doctors how to provide compassionate spiritual care while not coming into conflict with their own faith. Dr. Christina Puchalski, Director of The George Washington University Institute for Spirituality and Health (GWISH) says in the film, “I was part of a study looking at the role of spirituality in the lives of medical residents specifically with regard to burnout and depression and sadly the rates of burnout, depression and suicide are very high among physicians, medical students and residents. In that particular study my colleagues and I found that residents who had some sort of spiritual belief values supporting them tended to have lower rates of depression and burnout.” Dr. Rachel Naomi Remen works to help doctors overcome burnout. She runs storytelling circles that allow doctors to talk with other medical professionals about what they see and experience each day. In the film, doctors in one such storytelling circle help explain the ways in which they find meaning in their work. “Your Health: A Sacred Matter" was filmed on location nationwide and was funded by the John Templeton Foundation. It serves as a comprehensive overview of the relationship between religion, spirituality and health. It weaves together compelling individual stories from doctors, patients, nurses, chaplains and caregivers. The lives they share on film are ones of personal transcendence, courage and dignity. The program is being broadcast on PBS stations nationwide (check your local listings). (Note: the following is for publications with appropriate deadlines) It is airing on the WORLD public television channel at 8pm on December 2nd with a repeat on Sunday, December 3 at 9pm PT. WORLD is produced and distributed by WGBH/Boston, American Public Television (APT) and WNET/New York in association with Public Broadcasting Service (PBS). Check your cable listings for the WORLD Channel to find your local station.